The artifact is an engraving taken from one of the most influential and beautiful sources on the monuments and antiquities of ancient Rome, The Antiquae Urbis Splendor, (The Splendor of the Ancient City). The book served as an important reference and source of inspiration for many writers and artists. Giacomo Lauro, the engraver, was a Roman print maker who was active from 1583 to about 1650. 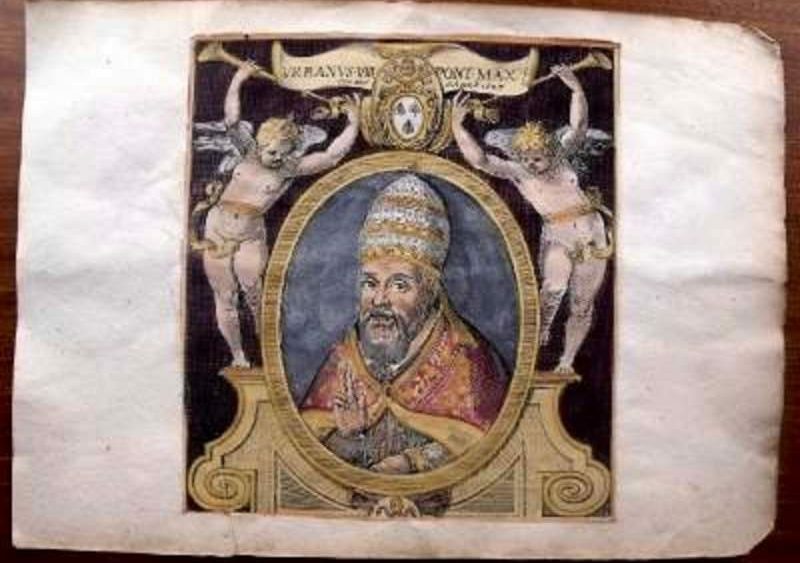 The portrait is hand colored and an excellent impression of the Pope. The engraving measures 32 X 23.2 cm. 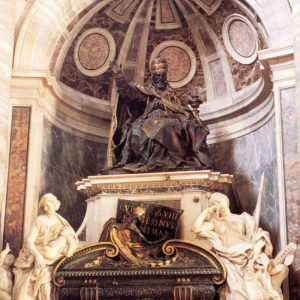 Artifacts connected to Pope Urban VIII have become very desirable because he beautified Rome, was significant in the building of St. Peter’s Basilica and commissioned Bernini as the architect. During Urban’s pontificate, Galileo, who had been a personal friend, was forced to recant his belief in the Copernican Theory (that the earth revolves around the sun) —or undergo the tortures of the Inquisition. It is nearly impossible from this vantage point to sympathize with the Church that allowed this to happen. Certainly it was more about papal authority than it was about looking at scientific evidence. Galileo’s information was unfamiliar and in stark contrast to presumptions about the natural world and as such was considered heretical. Urban eventually freed Galileo after he recanted, but not before he had become a secular saint, and the harbinger of future conflicts between the papacy and science. 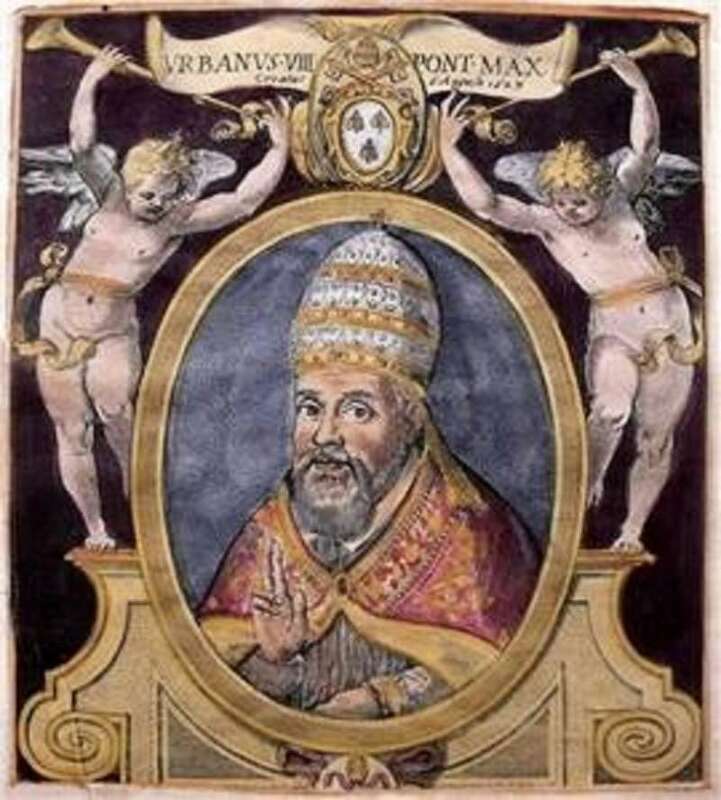 It was also during his papacy that the Jansenist movement began and about which he issued a bull in 1642 censuring Cornelius Jansen’s work, Augustinus. This movement agitated the Church for generations and centered on extreme views of St. Augustine (354 – 430) on grace and predestination. 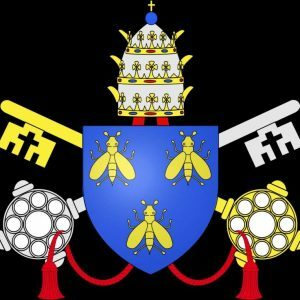 The Catholic Encyclopedia states that it is difficult to pass correct judgement on Urban VIII. Even though there are questions about his finances and certain decisions in European politics, his private life was beyond reproach and the common welfare of the Church seems to have been the mainspring of his pontifical labors. At any rate by the time of his death he was immensely unpopular. 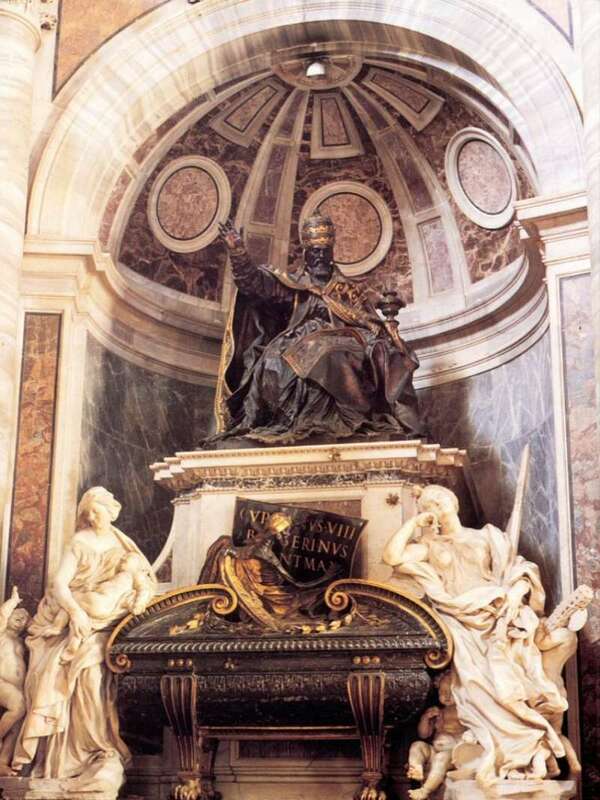 He died in 1644 and is buried in St. Peter’s in a tomb constructed by Bernini. Urban VIII has become more popular as the years have gone on primarily due to his support of the arts, particularly of Bernini. In the world of collectors anything to do with Urban VIII is highly sought after. On Sept. 17, the Catholic Church honors the memory of one of its intellectual giants, who also happens to be a saint. 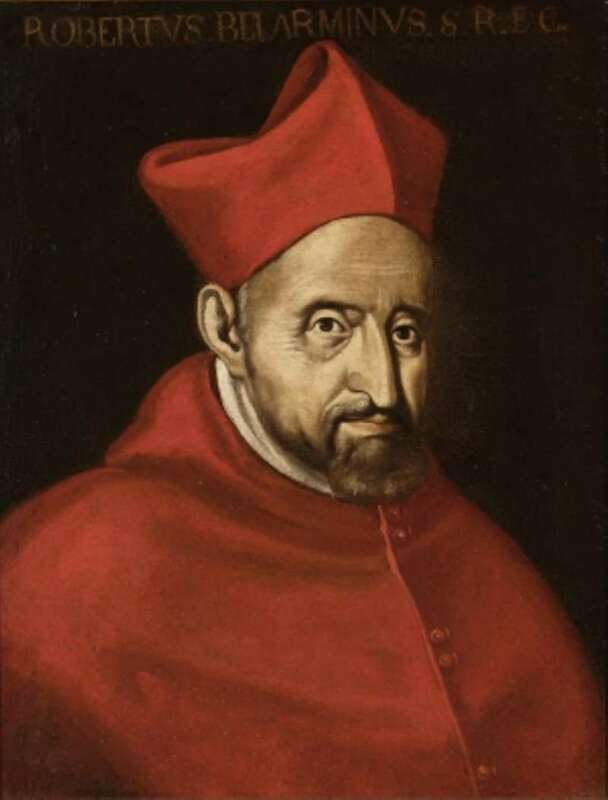 St. Robert Bellarmine, who died in 1621, was a great teacher, churchman and cardinal. 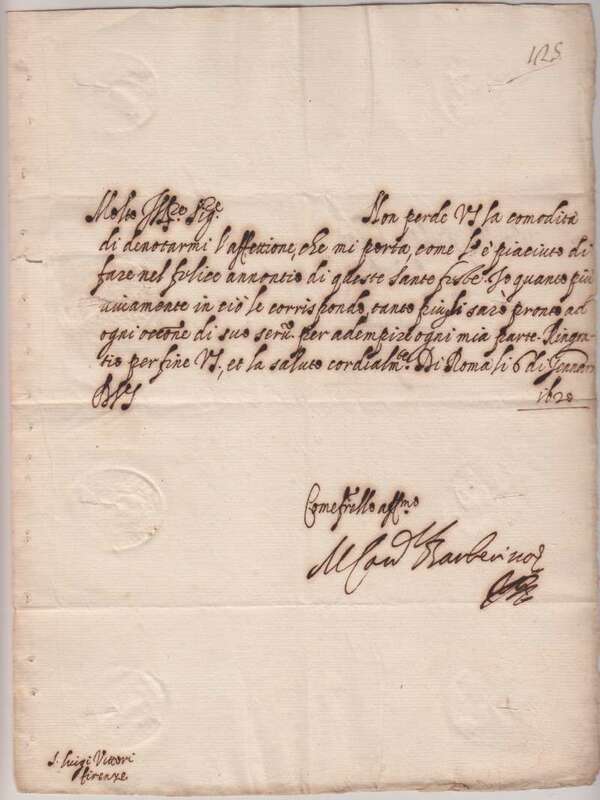 But from the secular side of things he has a bit of controversy, because he played a role in the Galileo affair. 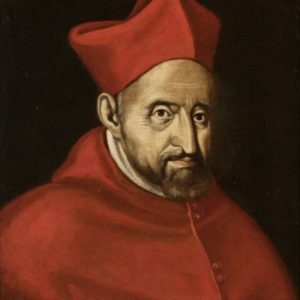 The Galileo controversy is one that many anti-Catholics cite when they want to attack the church as anti-science or to claim that the church is not infallible as it claims. A little knowledge of history easily dismisses both claims. 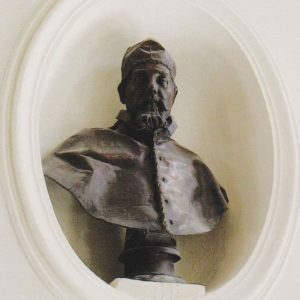 Bellarmine, on behalf of the Holy Office (today the Congregation of the Faith), had to admonish Galileo for teaching the heliocentric theory,which claimed that the sun and not the earth is the center of the universe. At the time, the thought was that the heliocentric theory was contrary to the Scriptures, so the issue became problematic when Galileo, a scientist, started to make theological claims. First the church has been one of the most supportive institutions of science in history. For example, the first major scientific study done on the heliocentric theory by Nicolaus Copernicus was dedicated in honor of Pope Paul III. Any elementary knowledge of scientific history will show how many clerics (including Copernicus himself) were scientists and how often elements of the church were sponsors of scientific experimentation. As far as the infallibility claim, that is actually preposterous. 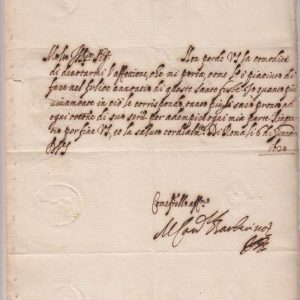 No pope ever tried to make an infallible ruling in the Galileo case. There was no ecumenical council ever called regarding Galileo. In fact, the pope was not even the primary player in the controversy. Rather it was an ordinary tribunal of the Holy Office that judged Galileo, and that is far from an infallible claim; no issue of infallibility should ever be associated with this case. Even though it was many years earlier that Copernicus first proposed the heliocentric theory, it’s Galileo who is most associated with it because of the controversy which spilled into theology. In 1614, Galileo was challenged by many charging that his theories were contrary to Scripture since there are several passages that refer to celestial motion and the Earth’s stability. Up until this point, the overwhelming number of scientists held the geocentric theory that the earth was the center of the universe and that everything, including the sun, revolves around the earth. Galileo had cautioned against a literal reading of the scriptures; the church was understandably wary of a scientist making personal interpretations of the Bible, considering it had recently endured the Protestant Reformation. The church did not want a scientist speaking “authoritatively” on a theological matter. 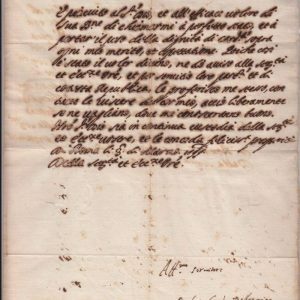 Galileo pushed the envelope in 1623 when he wrote a book called “Dialogue on the Two World Systems,” when he used the argument of the church (or the pope for that matter) and put the pope’s argument in the mouth of a character named Simplicio. You see, even really smart people can do really stupid things. 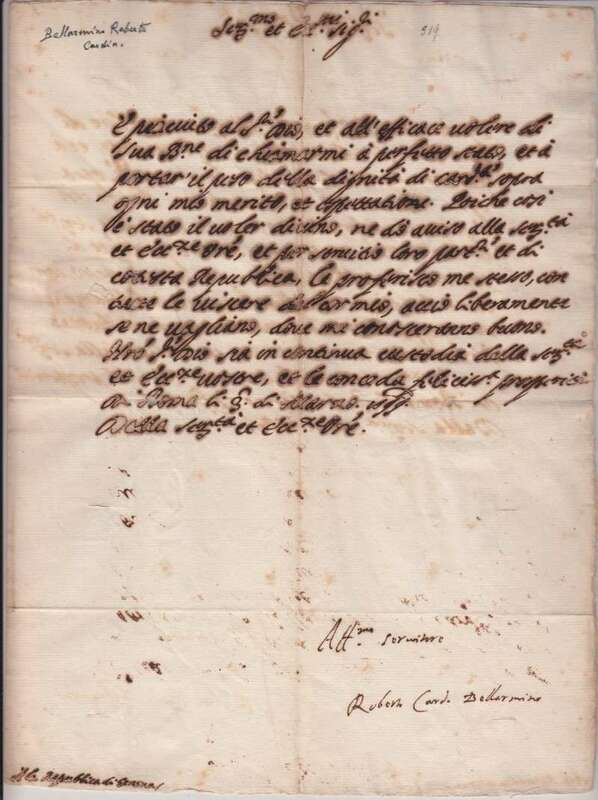 Pope Urban VIII did not take too kindly to Galileo, or to Simplicio for that matter. It is here that things started to go really badly for Galileo. The pope felt mocked, and indeed he was, but contrary to urban legend Galileo was never tortured. He was, however, put under house arrest and forced to recant the heliocentric theory. For all the people who like to throw barbs at the Catholic Church for not adopting Galileo’s teaching and for reacting to him in an admittedly bad way, it needs to be noted that had the church adopted his heliocentric theory, it would still be in error. Modern science has made it quite clear that the sun in our tiny solar system certainly is not the center of the entire universe, as Galileo claimed. 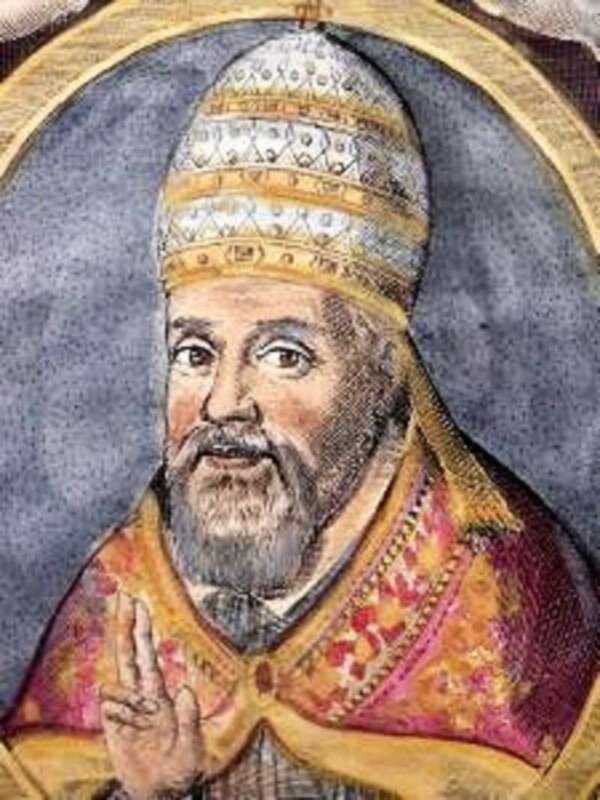 The worst that can be said of the church in hindsight is that the penal aspect of how Galileo was treated was not appropriate by today’s standards, something Blessed Pope John Paul the Great addressed in 1992 when speaking to a commission from the Pontifical Academy of Sciences. 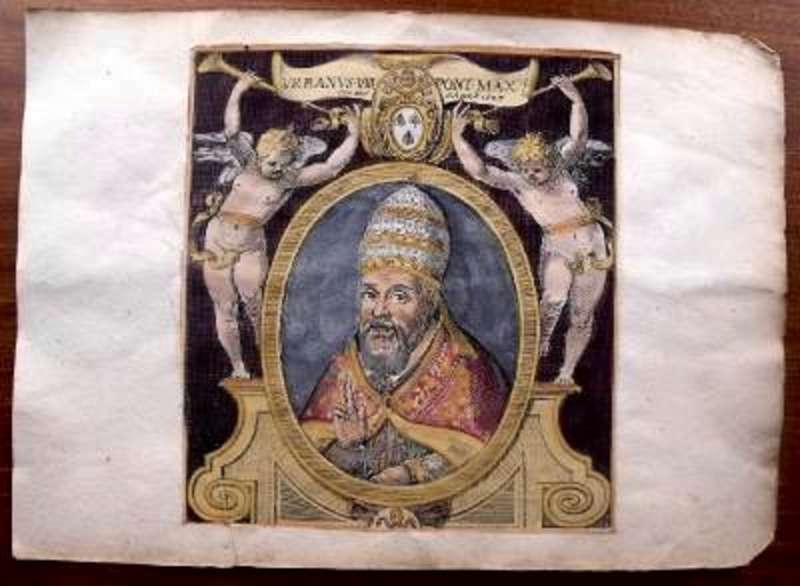 The pope said, “The Galileo case has been a sort of ‘myth,’ in which the image fabricated out of the events was quite far removed from the reality. In this perspective, the Galileo case was the symbol of the Church’s supposed rejection of scientific progress.” The pope went on to say that there was error on both sides and that the conflict between Galileo and the church should never have happened, because faith and science properly understood can never contradict one another. 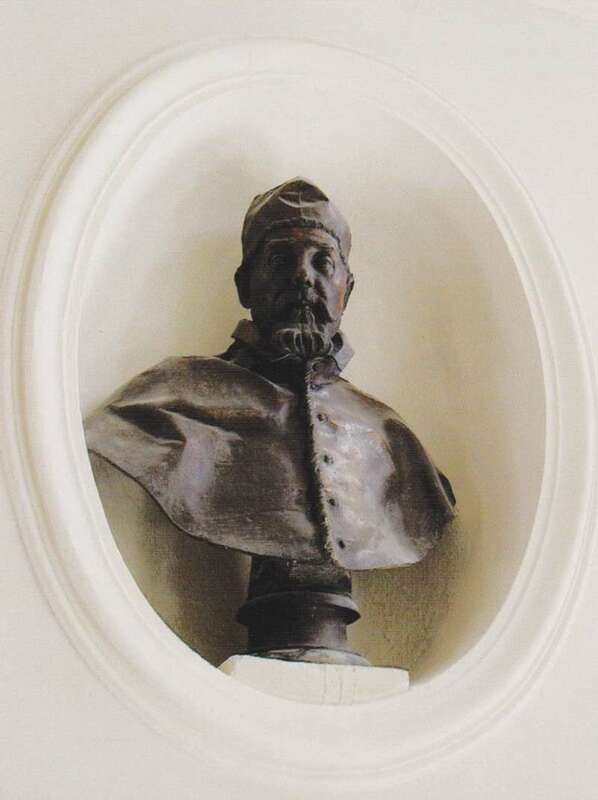 So today Galileo is exonerated and we still pray to St. Robert Bellarmine for his intercession.